Water is the indispensable factor in any form of life on Earth. In plants, water is used to transport nutrients and their uptake by roots. As a result, optimized water control results in significant results in terms of liveliness and production. In the vast majority of crops, the water used is that of the tap, which, depending on the proximity of the water plants, the use of a general water softener or the quality of the domestic plumbing circuit, less good ". Thus, the simple fact of taking the water of irrigation and of letting it decant 24 to 48 hours in a tankin the open air and away from light will allow it to discharge chlorine, a chemical element detrimental to plants (high concentration promoting potassium, calcium and magnesium deficiencies ) and whose rate has increased in recent years to combat possible terrorist attacks by water. Moreover, the use of a water filter is useful but not totally effective because the solids dissolved in the water are not retained, only the particles in emulsion. Only the installation of an inverted osmosis , made up of semipermeable membranes of polymers retaining any impurity of the water which crosses it, guarantees a pure water. The nutrients, provided by water, are essential elements to the life of the plants. A precisely dosed nutritional intake by the horticulturist allows fast-growing plants to reach their full potential, offering far more cumbersome and better crops. In most cultures, tap water is used which is more or less "good". More efficient fertilizers: Let the water settle in a tank (24H-48H), filter the water to remove the impurities, and for an even purer water, use an inverted osmosis. Each fertilizer is general or specialized. Be careful some are made only for growth, others for flowering and others for passive hydroponics. Culture Indoor has classified its fertilizers to allow you to use precisely what your plant needs. As humans need calcium (bone), iron (red blood cells) and potassium (heart), plants need nutrients. 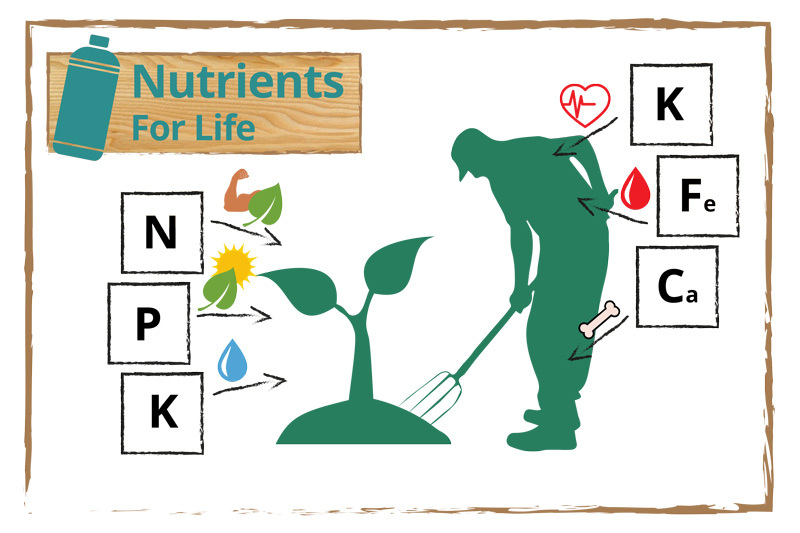 The basic fertilizers are all composed of three macro-nutrients: nitrogen (N) , phosphorus (P) and potassium (K) . Nitrogen is a chemical molecule which ensures the growth of plants, intervening in the production of proteins and thus directly influencing the metabolism of the plant. without nitrogen, there are no strong plants. Nitrogen makes plants strong and healthy. Phosphorus stimulates plants to stimulate their root environment, as well as more abundant flowering and fruiting. Phosphorus moves energy. Phosphorus promotes photosynthesis. It is responsible for storing and moving energy through the plant. As for potassium, this last major macro-nutrient guarantees a better circulation of water and nutrients, and a gradual release of its two sources of energy, throughout the plant, from roots to summits. It also strengthens the walls of molecules to make them more resistant. Potassium helps plants control and use water effectively. Totally or partially, supplementary fertilizers or fertilizers, additives, provide three essential macro-nutrients and other multiple secondary micronutrients. Like magnesium , calcium, boron, zinc, iron, manganese, sulfur, etc. But nevertheless deserving all the attention of the demanding farmer. The pH or hydrogen potential is essential to control in a soil or hydroponic culture. Regulated, it optimizes the assimilation of the nutrients by the roots. To manage the pH of a nutrient solution while taking into account the slight acidity of the fertilizers and additives employed, a pH meter and regulatory solutions are required (see section "Controls"). On a clay crop, watering water is established at pH values ​​of 6.2 to 6.4 in growth and 6.6 to 7.0 in bloom. More acidic on a hydroponic medium, the pH of the water must be between 5.6 and 6.4 growing and between 6.0 and 6.5 in bloom. For pH control use a pH tester . Indispensable to master in hydroponic culture, the EC (Electro-conductivity) represents the concentration of mineral salts dissolved in the water. The minerals present in the fertilizers emit an electric current that the EC-meter quantifies (see section "Controls"). As the nutritional requirements of plants increase, the level of EC increases proportionally. Generally, EC measurements range from 0.8 to 1.4 during the vegetative stage and from 1.4 to 1.6 during pre-bloom to 1.6-2.2 (culminating at 2, 6) according to the development of plants. In addition, the acceleration of plant metabolism requires follow-up of EC values ​​accordingly. In soil, testing the EC of the water that has passed through the pots is interesting to prevent any excess nutrient salts accumulated around the roots due to poor drainage. If this is the case, the soil should be rinsed with pH adjusted water or with an enzymatic solution (living bacteria decomposing dead roots and nutrient salts to make them assimilable by roots), or water RO. Temperature The temperature of the irrigation water must be between 18 ° C and 20 ° C, whatever the substrate. Keeping the temperature below 21 ° C prevents the development of pathogenic mushrooms in the roots (yellowing, fragility, development of a form of slimy and odorous drool ...). Beyond 24 ° C, water depletes oxygen, causing degradation of roots and minerals in fertilizers. For EC check use an EC tester . Promotes the growth and structural development of the plant, as well as vigorous rooting. It prepares for a beautiful flowering. Consult our Growth Tips . Gives the plant everything it needs for abundant flowering and fruiting. It also allows you to make the most of the genetics of your plants. Check out our Flowering Tips . The nutrient solution is renewed every two weeks, and more often when the plants are large. The best prevention is to renew frequently and rinse the support with pure water between two solutions. EC must be checked every day (in reservoir, holder and drained solution) Acceptable EC value: 0.75 to 2 ms check that the water pH is between 5.5 and 6 , 5 before adding the fertilizer. Fast-growing plants require large quantities. It is mainly responsible for the growth of the plant. Nitrogen is able to move from one part of the plant to another according to its needs. Nitrogen deficiency results in slowed growth, symptoms appear first on the leaves at the bottom of the plant that turn yellow before falling. These symptoms then spread to the rest of the plant. The stem and leaf veins may turn purplish red. Nitrate is a form of nitrogen used in hydroponics for its slow absorption. Consider diminishing the intake during flowering as it alters the taste of the crop. Phosphorus is necessary for photosynthesis and energy transfer within the plant. Fast-growing plants require more phosphorus when germinating, sowing, cutting and flowering. A lack of phosphorus slows growth, leaves are smaller, bluish and often spotted. The main veins turn purplish red on the inner side of the leaves. A phosphorus deficiency is common when the pH of the culture medium is greater than 7 or less than 5.8. Fundamental to the synthesis and growth of cells. A calcium deficiency, uncommon in the interior (usually caused by high humidity or dense production) prevents the cell walls from being maintained. The plant, more sensitive, appears "soft" and its young leaves wilt. Fundamental to enzymatic systems and electron transport during photosynthesis. Catalyst for the production of chlorophyll, iron is necessary for the reduction and assimilation of nitrates and sulphates. Iron deficiencies are common when the pH is above 6.5. The symptoms appear on the smallest leaves that turn yellow between the veins that remain green. Magnesium, an indispensable element, is the central molecule of chlorophyll, which transforms light energy into chemical energy. Magnesium deficiency is manifested by chlorosis (slight discoloration between the veins of the aged leaves), rust spots and early leaf fall. An excess disrupts growth and leaves remain small. Potash improves flower color and fruit flavor, giving plants better resistance to parasites, diseases and weather. A deficiency results in yellowing of the oldest leaves beginning with the tip. The plants are more sensitive and the stems are brittle, rust-colored spots appear on the leaves. Enzymes act as an accelerator (catalyst) of a variety of biochemical processes of the plant. They convert carbohydrates into alcohol in seconds, against several weeks in normal times. The enzymes improve the water retention capacity and the aeration of the substrate which remains clean, free of excess elements (this is important in the case of re-use). Dead parts such as roots decompose more rapidly, releasing many nutrients that concentrate on the protection of pathogens. The root system is more efficient. Some are organic and suitable for organic cultivation, others are mineral and suitable for dripper irrigation. Mineral fertilizers. They must be fluid, perfectly soluble, 100% assimilable and free from residues. The product is only available outside France. Nutrient assimilation is a function of pH. The safety zone is between 5.8 and 6.8. to prevent acidification of the nutrient solution, use water with a pH greater than 6. Deficiencies within the framework of indoor cultivation generally occur as a result of the depletion of a growing substrate which is impoverished by being used. To avoid deficiencies, you can change the substrate with each new crop. Think also of each end of culture, to sterilize your pots with bleach, and to rinse well. Certain deficiencies are not visible if the stage of deficiency is not at term. If you do not treat the disease, the plant can get sick because weakened, so it is important to react when you diagnose a deficiency. Culture Indoor proposes to consult the Guide of the deficiencies .